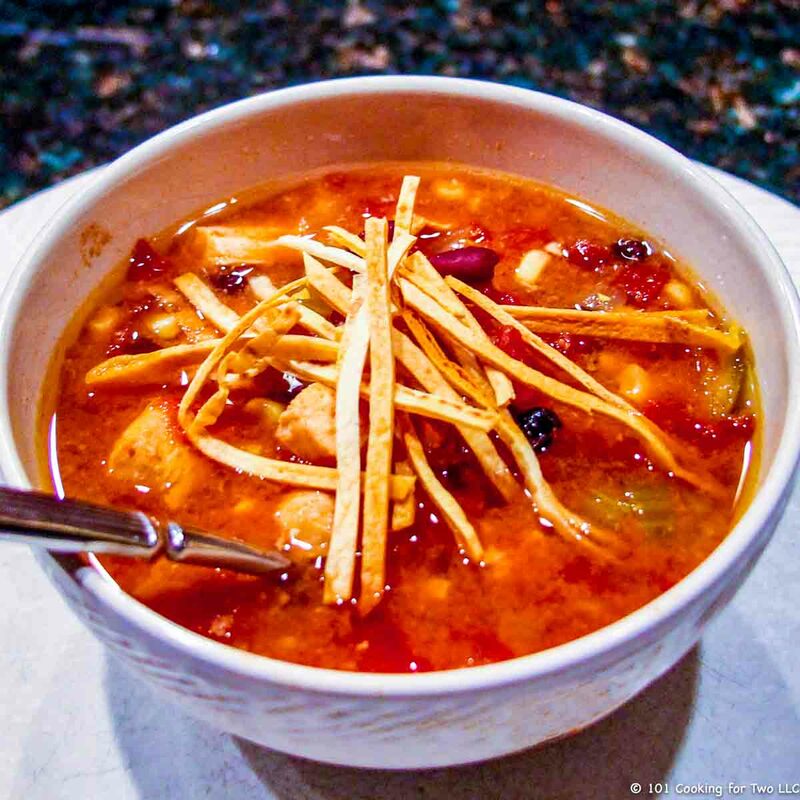 Easy and delicious, this crock pot chicken tortilla soup is the perfect healthy hearty soup. Just follow these simple step by step photo instructions. Top with tortilla strips and other toppings of your choice. Editor’s Note: Originally Published January 11, 2014. 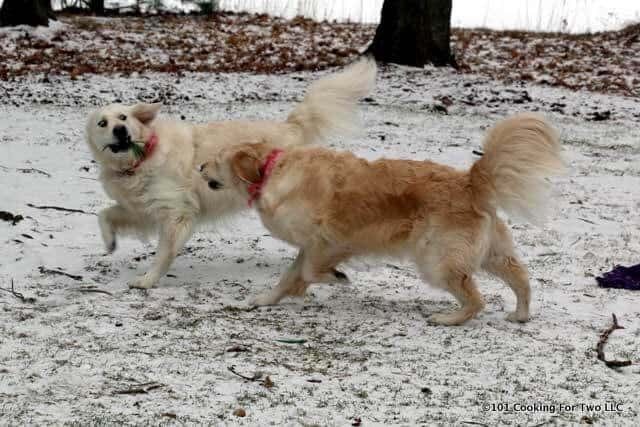 Updated with expanded discussion, clarified instructions, and re-edited photos. I have a nice stovetop version, but it wouldn’t scale down well, so I needed to look around. Nothing was quite what I wanted, so I combined a few. Add a little this, take out some of that, um done. Mostly this recipe is opening cans. The hardest part is chopping the onion. You can do this with only 10 minutes of active time. 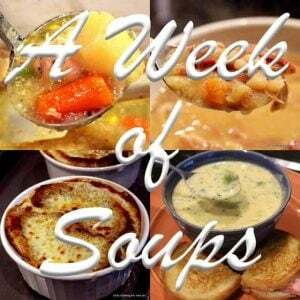 Last year, I did a Week of Soup where I featured 9 of my best soups/stews. Check them out soon. A nice solid higher 4. We like our chicken soup with lots of meat. 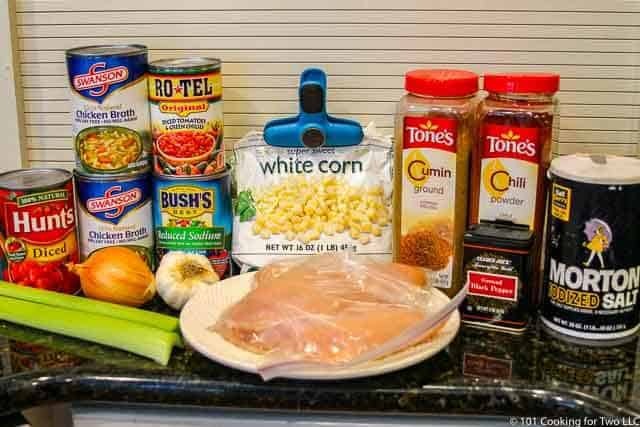 Some recipes use as little as 3/4 pounds of chicken for this volume of soup. I suggest 2 skinless boneless chicken breasts which will generally be about 1 1/2 pounds. But could range from 1 to 2 pounds. You may use skinless boneless chicken thighs if you want. You can trim and cube the chicken before cooking or toss in the whole chicken breast and shred near the end of cooking — your choice. The RoTel provides a lot of the spicing here. The heat level is about 3/10. If you want more heat, RoTel comes in hotter versions, and there is an option for some cayenne pepper. 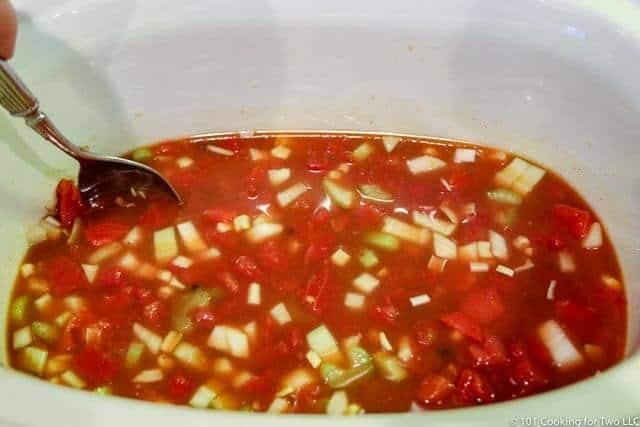 This is soup so put in what you want or have, and it will be good. 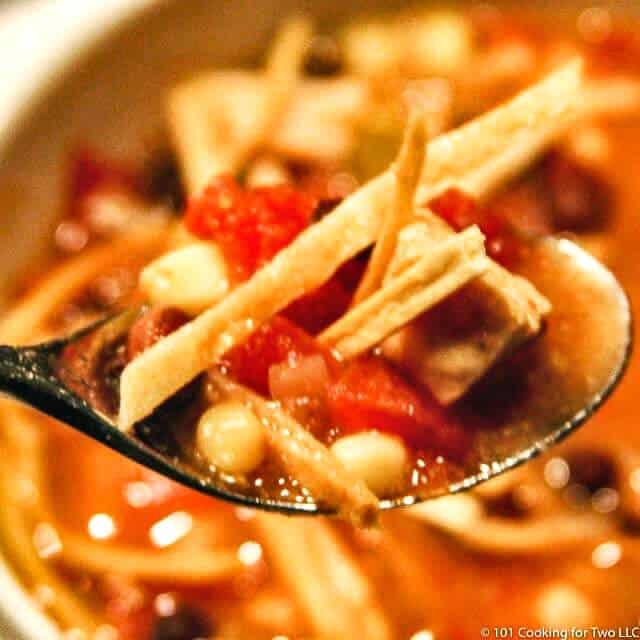 We prefer white corn for this soup — a touch of sweetness and more tender. I choose skinless boneless chicken breast but thighs would be fine. 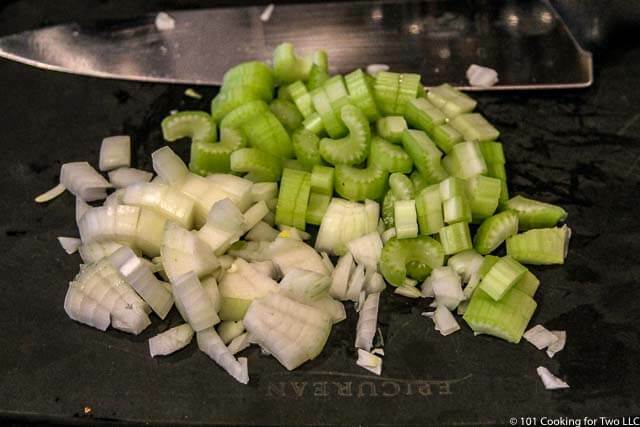 Chop one medium onion and a couple of celery stalks. 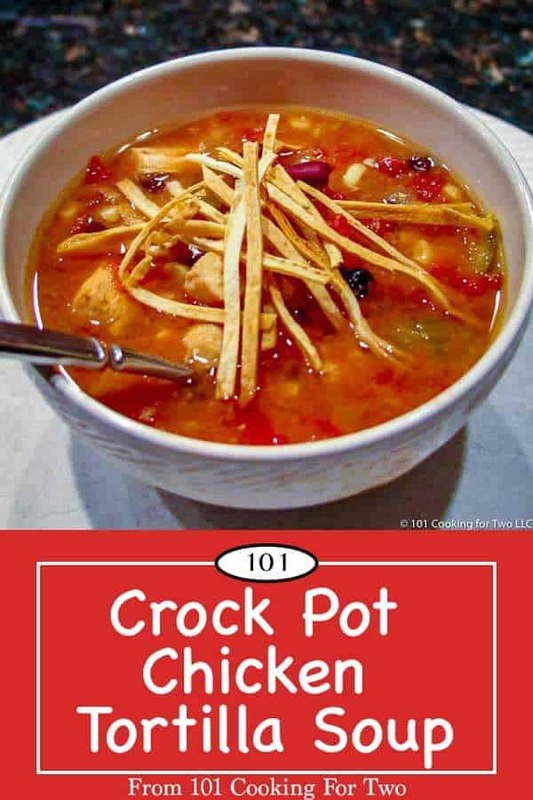 Mix veggies in a crock pot with one 10 oz can RoTel (Diced Tomatoes with Green Chilies), one 14 oz can diced tomatoes, 1 cup frozen corn or 1 can corn (drained), one 14.5 oz can black beans rinsed, 2 cloves crushed garlic, two 14 oz cans lower sodium chicken broth, 1 teaspoon cumin, 1 teaspoon chili powder,1 teaspoon salt, 1/2 teaspoon pepper, 1/4 teaspoon cayenne pepper (optional). Mix this all together in the crock pot. This will not fit in a smaller crock pot so use a 6 quart. 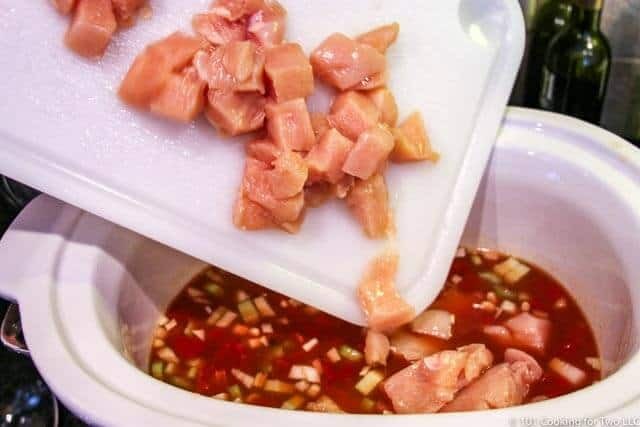 Trim and cut two medium skinless boneless chicken breast into bite-size pieces. Add to the pot. OR you can just toss in whole chicken breasts. If you do the whole breast then about 1 hour before the end point remove, shred then replace. 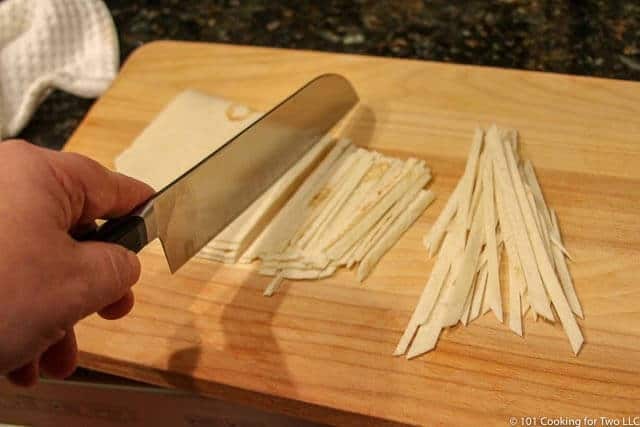 While soup is cooking, make some tortilla strips for topping. Preheat oven to 375. Thinly slice up a couple of tortillas. 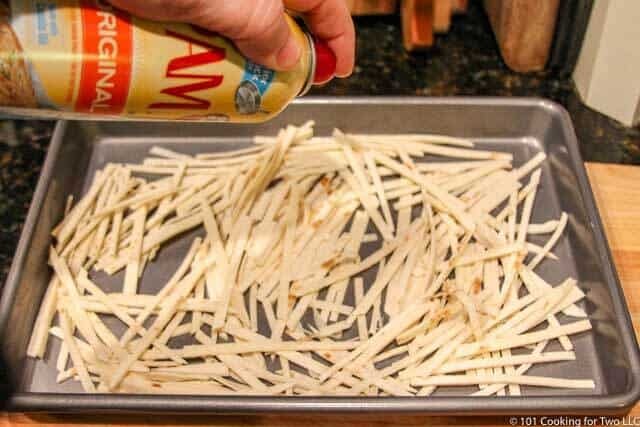 Spread the tortilla strips in a baking pan, give a light spray of PAM and bake until golden brown. About 10-15 minutes. This will vary some by your tortillas, and the oven so watch it. 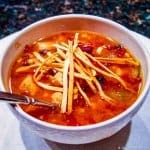 Super-easy and delicious, this crock pot chicken tortilla soup is the perfect healthy hearty soup. Just follow these simple step by step photo instructions. Top with tortilla strips and other toppings of your choice. 1 cup frozen corn - or 1 can corn drained. White corn preferred. 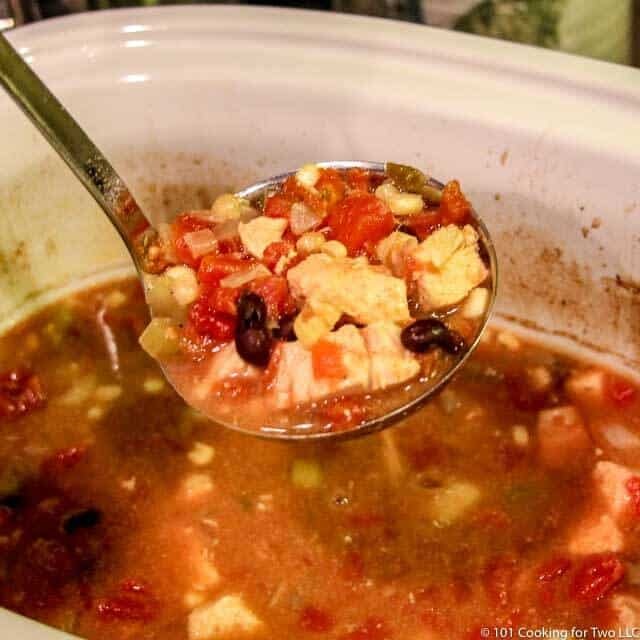 Mix veggies in a 6 qt crock pot with one 10 oz can RoTel (Diced Tomatoes with Green Chilies), one 14 oz can diced tomatoes, 1 cup frozen corn or 1 can corn (drained), one 14.5 oz can black beans rinsed, 2 cloves crushed garlic, two 14 oz cans lower sodium chicken broth, 1 teaspoon cumin, 1 teaspoon chili powder,1 teaspoon salt, 1/2 teaspoon pepper, 1/4 teaspoon cayenne pepper (optional). Mix this all together in the crock pot. Trim and cut two medium skinless boneless chicken breast into bite-size pieces. Add to the pot. OR you can just toss in whole chicken breasts. If you do the whole breast then about 1 hour before the end, remove, shred then replace. Spread the tortilla strips in a baking pan, give a light spray of PAM and bake until golden brown. About 10-15 minutes. This will vary some by your tortillas and the oven so watch it. You need 1-2 pounds of skinless chicken. I use breasts, but thighs will work well. You can cook the chicken breasts whole and shred near the end or cube at the beginning. Tortilla strips are not required, obviously and if you want you could use commercial ones. Top as you wish: Cheese, Sour Cream, Avocado, Cilantro, etc. Good refrigerated for 3-4 days. Freezes very nicely for 4-6 months.